This is an SBI review that tells my own personal story of how I built a successful business online, just by sharing my passion for holistic health and yoga. The building of my website continues to be an ongoing journey of satisfaction and connection to others. You too, can do the same! If you have a passion, knowledge or a hobby, and you want the opportunity to build a successful business, without having to know html, SEO, or other web building systems, this may be the tool for you! You can share your personal passion and make money too! When I first considered building a website, I only knew that I wanted to express myself and express what I believed in some way. SBI! known as Solo Build It! or formerly Site Build It! gave me the tools to express myself! I have always been passionate about wellness, fitness and health. In my core, I knew that western medicine was failing most people. People just did not connect with the spiritual reasons, the body-mind-soul reasons that contributed to their ill health. I had discovered that my body was a spiritual path to health and healing. If I listened to my body by meditating on the meaning of my particular areas of soreness, the 'aching,' I learned was the manifestation of my emotional and spiritual issues. I also meditated on the reasons for the physical manifestations of my dis-eases and learned the answers. As a result of my experiences and my lifetime of gaining knowledge, my desire and passion grew to where I knew I was destined to tell others of this. SBI! Gave a Voice to my Passion: An Honest Review of SBI! However, I had no real outlet for my new passion. I was working as a traditional nurse in a traditional home care setting. I was seeing physical manifestations of my patients' emotional pain. Their bodies were speaking. Their body was the window to their soul, their inner condition. While I was happy helping my patients in the individual setting, if they were willing, I wanted to do more. I wanted to speak to more people. I wanted to share my passion and my knowledge! I wanted this desperately! I searched the Internet for possible training programs to help me learn new techniques for healing. But soon, after trying several modalities myself, I realized that I could still only reach people one at a time. I wanted to reach more people. I truly wanted to help others on their path to health and healing. I started thinking about writing a book. That seemed too difficult, since I had witnessed a friend bare his soul in a book, only to be repeatedly turned down by publisher after publisher. I did not want to deal with any gatekeepers, or try to fit myself into a mold just to sell it to the gatekeeper! I wanted to tell my story with my own voice and my own parameters! I started to dream about building my own website. I knew I was good with using a computer, but I knew absolutely nothing about building a website. In my former job as an Occupational Health Manager, I worked with our department intranet site builder, and it all seemed very daunting and complicated. Writing HTML code was Greek to me. As destiny would have it, I stumbled upon a website referring readers to a successful system called SBI! (that stands for Solo Build It!) to build your own website, without needing to know how to write in HTML. Hmmmm…… My curiosity was peaked. I read all about it. I was very skeptical of anything that promised so much. It seemed too good to be true. However, I did want to speak my voice. I did desperately need to share my knowledge. After many weeks had gone by and much pondering, and reading and re-reading all the information that Solo Build It! gave me, I decided to take the plunge. I reasoned to myself that if I did not try it, I would never know for sure. I needed to give it a try. If this platform was no good all I would be out of is some time, because the product comes with a money back guarantee. My SBI Review ~ It Worked for Me! Well, the story has a happy ending, as you know, since you are reading my website! My honest review of SBI! is that it absolutely took me from nothing to what you see today. I can assure you that I have never done this before. I am no young techie, just a middle-aged adult who was finding a voice for her passion. All it took was the tools that this product gives you and the determination to make it work. It is no get-rich-quick scheme. It will take a commitment and a willingness to work hard. I am living proof that SBI works. The process of web-building is so simple, utilizing the SBI tools, that success through actual profits is achievable even for a total newbie, like me. This success is so much more than just having a website up! This is about making money too! Reviewing SBI is easy for me, because I went from nothing, to success. It is not a get-rich-quick scheme, but with hard work, a passion and grit, you too, can succeed with SBI! If you are experienced at this web building business, the tools for achieving success will be all that much smoother for you! This product truly does change lives. In fact, if you already have a WordPress blog/site, SBI will help you build your business with your already created WP site! Just click here to see how it works! SBI has changed my life and made my website accessible to a worldwide audience! As a side benefit, it has made me money, so that I am transitioning my passion into a meaningful income. I am currently making a nice supplement to my family's income! And I think my website looks pretty good, too, don't you think? I have become a solopreneur with the help of SBI! But best of all, my message is getting out there. I am helping others, in a meaningful way. This is the biggest rush of all! To know that my voice is helping others in their path to health and healing! As I review SBI, this is what matters to me most! I can also take my business with me anywhere I go. It is my goal to live and retire somewhere warm in the winter. I love Colorado and will always be here in the summer, though! If you follow your heart and do what you love, the money will follow! It is just the added benefit from it all. Reviewing what SBI can do for you, this is why this system works better than all others. You must have a heart and passion to succeed. This is not merely an empty make-money system full of empty promises! Whether you are a Work-at-Home-Mom, a retiree, a professional looking to sell your services online, a multi-level marketer, a creator of e-goods or hard goods, a real estate agent, or have your own local business, or even a teenager, you can establish traffic and improve your business online. Just click on this link, for case studies from SBI! of ordinary people who have done it! Here are their testimonials to let you know that it is true: Case Studies. The most amazing thing about Site Build It! is that you absolutely need NO technical, web-site building knowledge. Really and truly. I am not lying about this! I had never, ever built a web site nor a wordpress page before. I had never blogged before. I had never done any creative activity on-line before. You will only need the multitude of services that SBI! includes in your web package, to successfully build your own web business. The services are all about how to build a successful business, not merely about building a web site. That is what makes it so unique. Sometimes, the myriad of tools that SBI supplies is overwhelming! There are so many resources available to you, if you have sufficient energy, determination and passion to make your business work! You will have access to continuous mentoring through this Action Guide and additional mentoring is available if needed. The Customer Support is unlimited and one of the best all around! The proprietary block bulider system for creating a web page is genius! You do NOT have to know html coding. It is very simple to use, and yet ready for advanced web builders. It is an excellent tool to help advanced users break bad habits. Everything you need to establish your domain, optimizing the name and registering it is included. You can even optimize your niche for maximum profitability. The niche you choose is often different than you planned, when you use the SBI tools. You can even blog on this web platform (if you don't already have a WordPress blog), if that is your wish. The process is automatic and you won't need any additional skills or software. With SBI, you have a full, 90-day money back guarantee. You can try it with absolutely no worries when you have no risk! SBI continually adds tools through new updates and releases, to always keep you current in the world wide web arena! I cannot believe how many new releases I have experienced since 2009 when I first signed on with SBI. SiteSell.com was founded in 1997 by Dr. Ken Evoy and he is definitely not going away. His devotion and passion to help others succeed is truly remarkable. I personally studied every bit of free information that Ken Evoy gave out until I was satisfied that I could do it too. I must have looked at the Quick Tour video at least 5 times until I was ready to give it a try. I clicked on every possible link until I was satisfied that this system was no joke. I did not have anyone I knew to assist me or mentor me, or lead me down the right path. I only used the mentoring and services from SBI to succeed. If you don't want to take my word for it, please use their questions and answer service, to get the answers to your on questions! Just use this SBI Questions link! SBI is always there with 24/7 support, for all your needs. You can even hire their experts to build your website for you, if you have more money than time and want to express your own voice online! Ken Evoy is incredibly committed to his customers. He is always very active in the company forums with thousands of posts. The personal effort that he puts into helping others succeed with their on-line business is truly amazing. I have never seen anything like it. He is so passionate about his vision that he repeatedly goes the extra mile in the forums. The SBI forums alone are worth the price of the subscription, because of him and many other successful SBI'ers. With all these benefits and no risk, I would strongly urge you to check out SBI! and see for yourself. What do you have to lose? P.S. To those of you thinking about choosing WordPress to start your business: If you want to blog, the obvious choice is WordPress. It has become synonymous with blogging. Here at SBI we think that WordPress is a great blogging software, but not a very good business-building software. See the report at SBI or Wordpress to get more information about why SBI is better if you want to build a business instead of just blog. If you are excited and ready to give SBI a free, 90-day trial, just click here to order now! Please also be aware that I do earn a small commission if you sign up for SBI through one of my links on this page. I never, ever, make recommendations that I do not believe in. I thank-you for trusting me and for your support. Beware of Fake Reviews of SBI! It is sad for me to have to discuss this, but because of the success of Solo Build It, it has come under attack by less than superior competitors, especially a company called Wealthy Affiliates. These competitors offer too-good-to-be-true promises of making money online. There is no incentive for them to teach you anything about building a business online, because they care more about making money off of you! If you do an "SBI reviews" search on the web, you WILL find fake reviews of SBI! intended to tear down this wonderful company, that i have used since 2009! 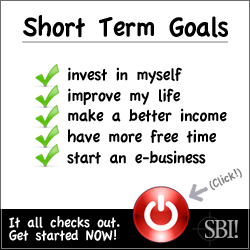 SBI is a legitimate business, with legitimate business-building tools! Instead of giving you web-building tools, the competitors pay you to write reviews of their products! Instead of building your own business, they are soliciting you to write reviews of their "superior" product! What a scam! These competitors will also have you write fake reviews of SBI!, but if you look carefully, you will notice that they never give actual statistics comparing the success of those using their system vs. SBI! Is that telling or what? Just like fake news, fake reviews of SBI are quite damaging, to you and society. It misleads consumers, for the sole purpose of making money. It steals legitimate business from SBI! This practice has become so bad and so extensive, that consumer protection groups may need to become involved! SBI has done extensive research comparing Wealthy Affiliates' success rate with theirs. As it turns out, SBI has placed 33 times more sites into the top ranking positions than WA, despite WA having 70% more sites! If you want to delve into their study, please click here, for more proof that SBI is superior! I have no doubt that I would not be here today, if I had believed the WA fake reviews and had chosen them over SBI! I am writing this section of my SBI review, because when the fake news first came to my attention, I was appalled at how far unreputable internet marketers will go to destroy a product that I have used and loved for years! I hope you do not fall prey to their fake reviews of SBI! Salutation and Final Review of SBI! If you are interested in building a business online, from your knowledge, passion or hobby, I can wholeheartedly recommend SBI! It is my deepest desire, for all who read this to succeed. If there is any way I can help, please contact me! Peace, Health and Prosperity to all my readers!